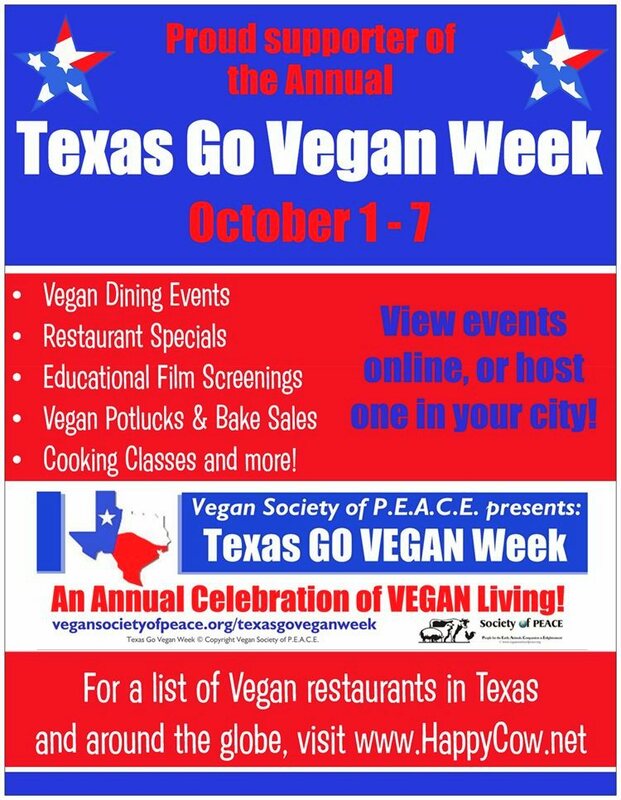 Our 2014 TEXAS GO VEGAN WEEK EVENTS are listed below, with more being added as the week gets closer! We welcome everyone in Texas to participate. Hosting an event is easy and fun! Thursday, October 2 (Austin): "Drop in for Lunch or Dinner" Day with Vegan Giveaways at Counter Culture Vegan Restaurant. Saturday, October 4 (Statewide): "Wear a Vegan T-shirt" Day! Saturday, October 4 (Houston): Farmers Market Vegan Vendors 'Day of Support' at Eastside, featuring Sinfull Bakery and Ripe Cuisine. Also featuring Pat Greer's Raw Kitchen. Sunday,October 5 (Houston): Vegan Society of P.E.A.C.E. "Dinner & Door Prizes" Open House Celebration Event at Loving Hut Vegan Restaurant. Hourly door prizes, free vegan starter kits and more. Tuesday, October 7 (Houston): Vegan Society of PEACE "Vegan Dinner Buffet Celebration and Trivia Night" at Pepper Tree Veggie Restaurant. RSVP required! Wednesday, October 8 (Austin): Counter Culture Restaurant presents a Film Screening of "Cowspiracy: The Sustainability Secret" at Cinemark Tinseltown Theaters in Austin.